The initial pilot project for a culture of peace, launched in 1993 in El Salvador, was evaluated in the First International Forum on the Culture of Peace held a year later in San Salvador 16-18 February 1994. I was told by those who attended that it was a remarkable political event in which the conflicts of those who had been enemies during the long civil war were constantly revisited, but effectively channeled into constructive engagement. The final report included a valuable summary of the principles for a culture of peace (reprinted in the culture of peace monograph). Under the effective direction of Francisco Lacayo, the El Salvador Culture of Peace Programme became a successful model of what can be accomplished. Along with Mirta LourenÃ§o, who was responsible for the project at headquarters, we published a report from the project in 1996 in the International Journal of Peace Studies, which is available on line. A formal internal evaluation of the project, carried out for UNESCO by Ansgar Eusner in April 1998, confirmed the conclusions provided in the published report. When the UN peacekeeping forces withdrew from El Salvador, a ceremony was held at UN headquarters in San Salvador to pass the responsibility for peace to the culture of peace programme. However, in the long run, the international funding for culture of peace in El Salvador was not continued, and the programme was discontinued by the end of the decade. Meanwhile, other pilot projects had been undertaken, beginning with Mozambique. As mentioned earlier, I had engaged Luis Tiburcio in early 1993 to help develop a pilot project in Mozambique. On his advice, I sent a personal note to the Director-General on 1 July 1993 suggesting that he discuss a pilot project with Mozambican President Chissano during his visit to Paris. At the July Round Table, GraÃ§a Machel was unable to attend, but the presentation given in her place by Ms Afonso, the Secretary General of the National Commission, strongly affirmed the need for culture of peace in Mozambique. Along with Luis Tiburcio, I went on mission to Mozambique at the end of September and came back with a proposal for a pilot project that would be launched as part of the United Nations demobilization project (ONUMOZ). 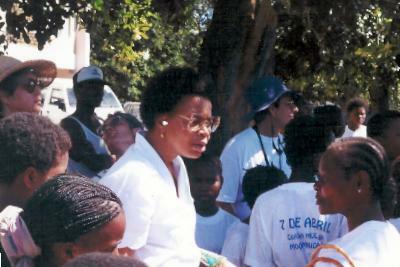 The mission was received and greatly supported by the Mozambique National Commission for UNESCO. GraÃ§a Machel, its President, assigned her education officer, Mr Noel Chicuecue, to work with me. Thanks to the extensive experience and wide contacts he had gained as a provincial education director, we were able to develop the initial lines of a project very quickly, which was submitted to the Director-General on 15 October 1993 along with my mission report. In response to the recommendation in my mission report, the Director-General made available $120,000 from the Social Science budget to be used for the Mozambique pilot project, and I went back with that money in my mission to Mozambique of April 1994 and followed up with another mission in October 1994. 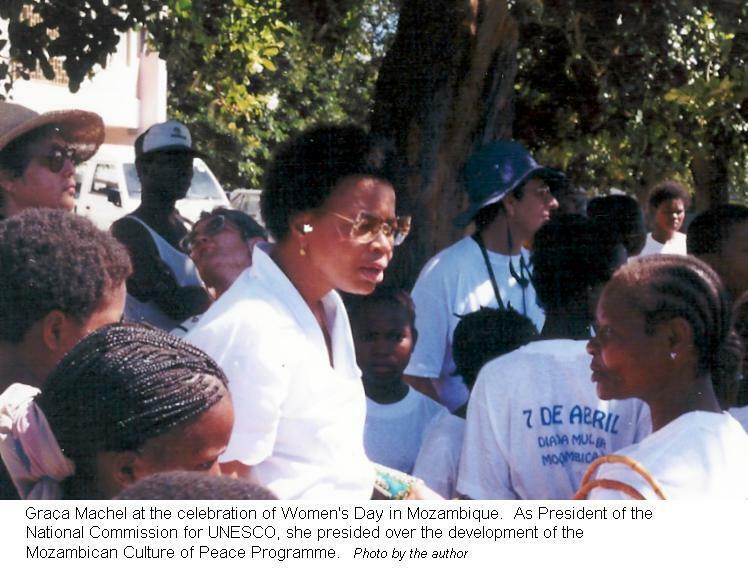 Graï¿½a Machel at the Women's Day Celebrations in Mozambique. As President of the National Commission for UNESCO, she presided over development of the Mozambican Culture of Peace Programm.